Surely I’m not the only one who remembers late night study dates huddled around a big table with a box of those sickly sweet soft sugar cookies loaded with extra sugary frosting and artificial colors. The ones where one was good and two was recipe for big bellyache and sugar crash. I won’t name names here but I think you know which one’s I’m talking about…yeah? Whenever I walk past them in the grocery store (even the ‘organic’ ones) my stomach half-turns but I still find myself mildly interested in them. Of course, I don’t indulge because my ‘built in avoidance mechanism for treat’ (aka severe egg allergy) won’t let me – but that doesn’t mean I don’t think about them – even after I’ve left the store. After that sentence, do you really need anymore convincing? Seriously, these cookies are crazy amazing – and that’s not always easy to say about a gluten-free baked good made without eggs. For this recipe we used the organic, lightly-salted, cultured butter and cream cheese. 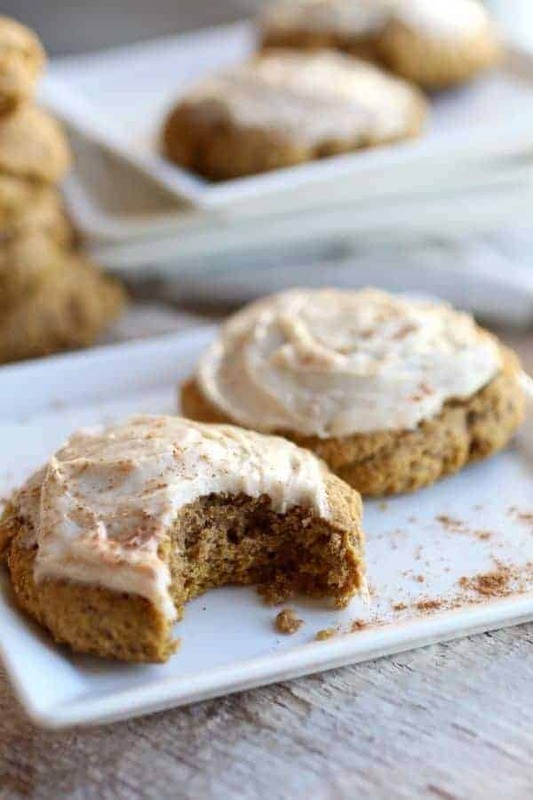 While developing and tweaking the recipe in the quest for the ultimate soft pumpkin cookie with cream cheese icing we tried a version using less pumpkin and a bit of plain yogurt – the texture was every bit as good as the pumpkin cookie but was lighter in color and less pumpkin-y. Not a failure by any means but rather a blessing as the batch made with yogurt were more like spice cookies and appealed to our taste testers who weren’t big pumpkin lovers (apparently those people do exist…). Just making these gluten-free and egg-free makes them suitable for a wide range of special diets – nixing the lactose just makes them all the more sweeter. Feel free to dust them with extra pumpkin pie spice or add a few sprinkles (like these naturally-dyed sprinkles). Which brings me to another thing I learned in college…sprinkles = jimmies. Who’d have thunk? But I keep calling them sprinkles because that’s how us Midwesterners roll. With the holidays coming you can easily double the recipe to make a big batch and freeze half. They freeze beautifully and I’ve taken to keeping a few in the freezer for an occasional after-school treat or impromptu cup of tea when friends drop by for a visit – because I can actually eat these! Hallelujah for a gluten-free treat made without eggs that doesn’t taste gooey or gritty. 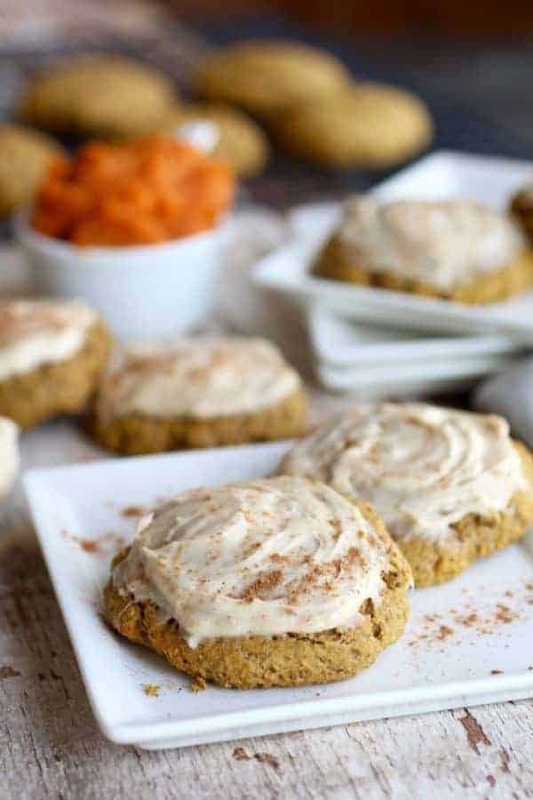 Wondering how these soft pumpkin cookies with cream cheese frosting stack up to conventional, store-bought frosted cookies? 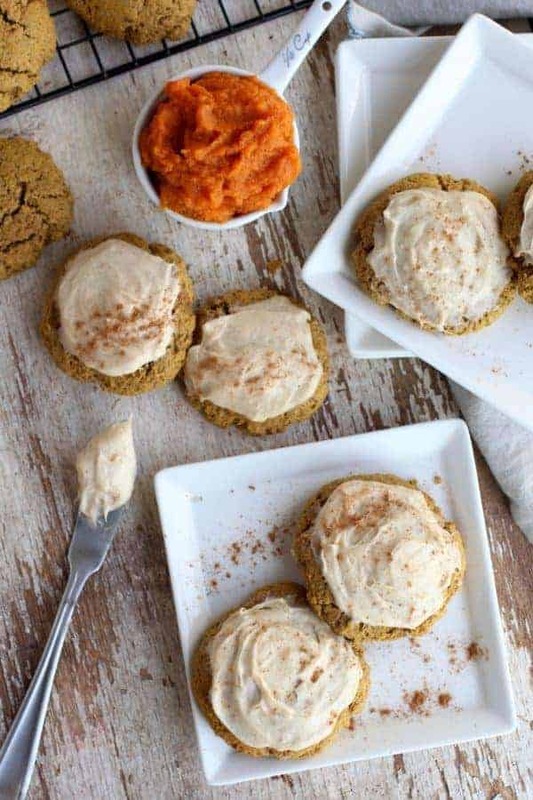 Our recipe halves the amount of sugar found in those brightly-colored disks of sweetness while coming in at roughly the same amount of calories, fat and carbs per cookie. So while not exactly ‘health food’ (they are a treat, after all) these are cookies that I can feel good about making for my family. One taste and I think you’ll agree. Make a batch today and see for yourself just how good they really are! 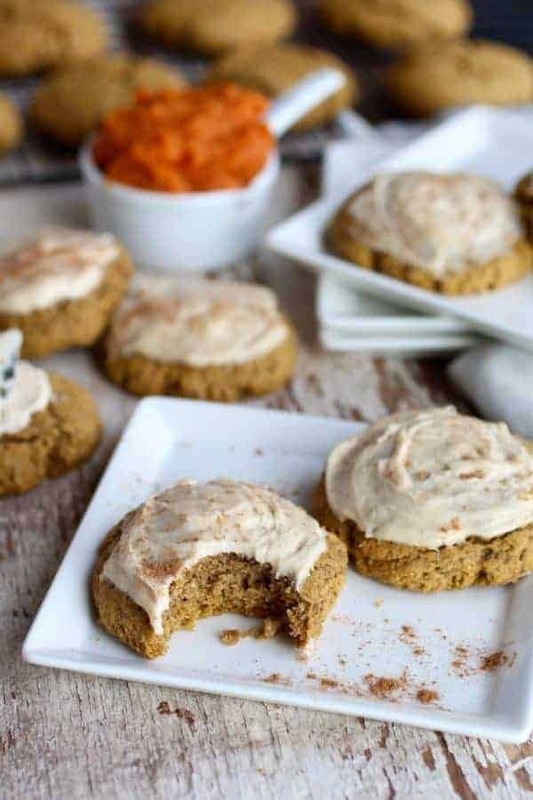 These big, soft pumpkin and spice cookies with creamy vanilla cream cheese frosting are made without gluten or eggs so now you can have your cookie and eat it too. Preheat oven to 400℉. Line 2 large baking sheets with parchment paper and set aside. In a large bowl add flour, sugar, pumpkin pie spice, baking powder and sea salt. Whisk to combine well. Prepare flax egg by placing 2 Tbsp. flax meal + 6 Tbsp. water in a small bowl, whisking to combine and allow to rest 2-3 minutes until a gel forms. Using a pastry blender or 2 knives, cut chilled butter into dry mixture until it resembles coarse crumbs. To the flax gel, add pumpkin puree and vanilla. Whisk well. Add the wet mixture to the dry mixture then stir with a large spoon until the dough forms into a ball. It should be smooth to the touch but not dry. If dough is wet and sticky, add more flour and stir again. If you dough is dry, add a splash of water and stir again. Roll dough into 24 golf ball-sized pieces, placing 12 on each baking sheet allowing enough room so that they won’t touch when flattened. Using your hand, gently flatten each ball of dough so that it’s about ¼-inch thick and 2 ½-inches in diameter. Place pans in the oven and bake 8-10 minutes or until bottoms are lightly browned and the tops of the cookies are set – rotating the pans back to front (spin ‘em) and top to bottom (swap ‘em) halfway through cooking time. Use a spatula to carefully remove cookies to a wire rack to cool completely before frosting. Place softened butter, cream cheese and vanilla in a medium bowl (or bowl of a stand mixer). Beat until well combined. Add powdered sugar and pumpkin pie spice and continue to beat on high speed until fluffy. 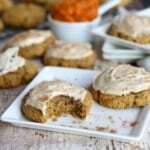 Spread frosting on cooled cookies and dust with additional pumpkin pie spice or sprinkles. 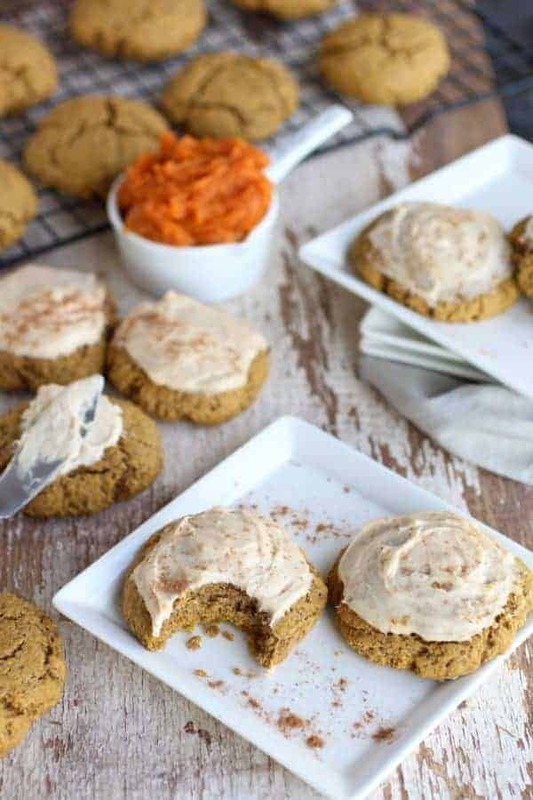 For a Spice Cookie with less pumpkin flavor and a lighter color – substitute ½ cup of plain yogurt for ½ cup of the pumpkin puree. Add 1/8 teaspoon nutmeg to dry ingredients. This recipe was tested using Bob’s Red Mill Gluten-free 1:1 Baking Flour. Other baking blends containing xanthan gum will likely work as well. If you have good results with a different flour blend, please leave a comment below and share your experience with others. This recipe has not been tested with paleo flours such as almond, coconut or cassava so we cannot say how they would turn out using these flours. Golden flaxmeal is less noticeable visibly in baked goods than regular flax meal. The perform equally well as a binder so feel free to use either. Ground chia seeds can also be used in place of the flax meal, however, expect the color of the cookies to be slightly darker. Yay! We’d love to hear what you think of them. You could use coconut oil though we’ve not tested it so can’t say for sure that it’s the perfect substitution. I made this recipe with brown rice flour and they turned out great! Thanks so much for sharing that! I’m sure others will find that helpful. So happy I have discovered you guys!!! Every receipe I have tried has been 5 stars!!!! Hi Ashley – We’re so happy you found us! Thanks for the rave reviews. I used King Arthur’s all purpose GF flour (which doesn’t contain xanthum gum), and they turned out great! Baked for 11 minutes at high altitude. Thanks so much for sharing! We love when others share what they did and how it worked out – especially when it comes to using different flours and baking at altitude. Do you think I can make these without the frosting and freeze? Then thaw and frost? Yes, that would work just fine! We have even froze them with the frosting on them. Should it be 2 tablespoons of baking powder or 2 teaspoons? Since they are egg-free, 2 T. is correct.